About the Book: It's time for bed but two little nuts, Hazel and Wally are having too much fun! Will they listen to Mama Nut? 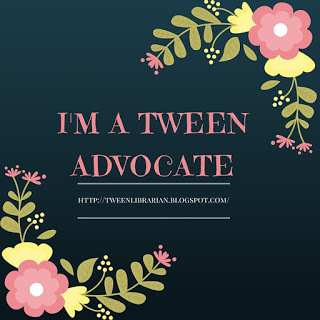 GreenBeanTeenQueen Says: I love Pete the Cat (let's be honest, I love the original four written by Eric Litwin). They are in my go-to storytime collection. I can recite I Love My White Shoes and Four Groovy Buttons from memory. 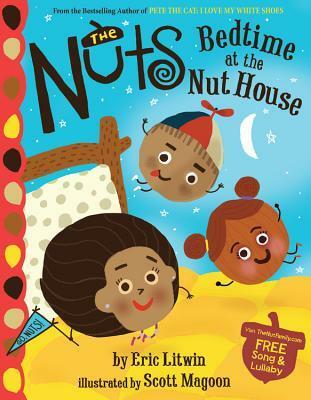 So I was excited about The Nuts because I couldn't wait to see what fun and groovy book Mr. Litwin would come up with next. And I'll be honest, the first time I read this one, I wasn't sure what I thought. It was cute, but did it meet my high expectations and was another good storytime book? Then I read it aloud to my niece and I had my answer-yes! The key to Bedtime at the Nut House is that it needs to be read aloud. The song needs to be sung and you need to have an audience to enjoy Wally and Hazel's antics. When I read this one in storytime, the kids really enjoyed it. I had them practice Mama Nut's song "all little nuts need to go up to bed" and Hazel and Wally's refrain of "we're nuts, we're nuts, we're nuts!" and then we were ready to read. The kids had a lot of fun singing "we're nuts!" and the parents laughed at Hazel and Wally's refusal to go to bed and the various ways they try to put off sleeping. Be sure to sing Hazel's part of "fig-a-nut"-it always gets a big laugh. And listen to the nut lullaby on www.thenutfamily.com-it's very sweet and I even sing it to my son at bedtime! When you have a one on one reading with a child or a small group, you can point out all the jokes in the illustrations. The "dipped nuts" in the ball pit, mama as a "roasted chestnut" when she's upset, and my favorite, the "Nutvana" poster in Hazel and Wally's room. There are so many funny things to find in the illustrations it's a book you'll want to read over and over. I would add Bedtime at the Nut House to your storyhour collection and gift to every parent and child who have had the battle over bedtime. Another winner from Eric Litwin! I can't wait for the next Nut adventure. Full Disclosure: Reviewed from galley sent from publisher and finished copy from library.